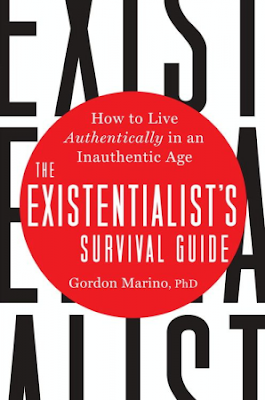 Brooklyn Digest: Books: "The Existentialist's Survival Guide"
Gordon Marino, a professor of philosophy and Director of the Hong Kierkegaard Library at St. Olaf College and the boxing correspondent for the Wall Street Journal, recasts the practical take-aways existentialism offers for the 21st century in his new book The Existentialist's Survival Guide. In an era in which every crisis feels like an existential crisis, Marino dispenses wisdom rooted in the works of the existentialists on how to face life head on and still keep your heart intact, especially when the universe feels like it's working against you and nothing seems to matter. Human beings are moody creatures, susceptible to psychological setbacks, crises of faith, flights of fancy, and other emotional ups-and-downs. Soren Kierkegaard, Frederick Nietzche, Fyodor Dostoyevsky, and other existentialists understood this well. Rather than diagnosing troubling moods as afflictions to be treated with pharmaceuticals, the existentialists believed that such feelings don't offer just enduring lessons about living a life of integrity, but also help to discern an inner spark that can inspire spiritual development and personal transformation. To Kierkegaard and his ilk, how we grapple with these feelings shapes who we are, how we act, and, ultimately, the kind of lives we lead. Marino makes this topic relatable, as he is just as likely to quote singer Bob Dylan as Camus and Heidegger, and the author calls this work a first cousin of Marcus Aurelius' Meditations. not entirely a step by step manual, but a set of life-altering and in some cases, life-saving epiphanies, this powerful and personal book is a repository of existential prescriptions for living an authentic and upright life in what is fast becoming a chaotic, inauthentic age. On love and racism: "We need the love of others to love ourselves, but in order to be nurtured by the love of others, we need to love ourselves sufficiently to accept that love...Herein lies part of the poison of racism and oppression. They profoundly damage a person's ability to love themselves." Self-help from the sages: "The thinkers between these covers do not offer a step-by-step plan for coping with our feelings of inadequacy or a checklist of behaviors to avoid. Instead of detailing some strategy for assuaging our depression, they might tender advice on how to keep our moral and spiritual bearings when it feels as though we are going under." Make friends with anxiety: "Kierkegaard's existentialist prescription is that we cultivate the capacity to abide with these unsettling moods, learn to sit on the couch with our fears. Why? Because according to our virtuoso of inwardness, 'Whoever has learned to be anxious in the right way has learned the ultimate.'" Acknowledge negative emotions: "Kierkegaard wants us to understand that while we might not have much choice in how we feel at a given time, we have control over and responsibility for the way we relate ourselves to those feelings. Having sway over our emotions requires an awareness of those emotions, which is not always easy." Don't take life for granted: "At the risk of being pedantic, the Kierkegaardian understanding of death might be this: don't be careless with the people you walk through life with. Don't have arguments and leave them unsettled." Be authentically self-aware: "The view of the virtues embedded in existentialism often returns to the requirements to be honest with oneself. And authenticity requires that we be candid with ourselves as to whether or not we have truly appropriated the opinions that we might be slapped on the back for espousing." Morality is a choice: "No one is born a coward or, for that matter, a hero. We only selectively want to believe it, but we can change. Moral U-turns are possible." Be open to love: From Kierkegaard's vantage point, the hardheaded, probability-calculating individual who talks himself out of love has talked himself out of that which is most precious in life. Kierkegaard admonishes: 'To defraud oneself of love is the most terrible, is an eternal loss, for which there is no compensation either in time or eternity.'"